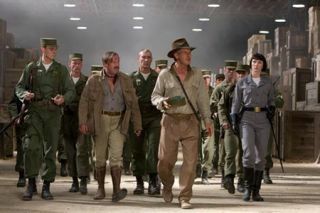 Indiana Jones remains most popular action film, says Best Buy | What Hi-Fi? Indiana Jones remains the UK's favourite action film, with more recent blockbusters failing to knock 1980s and '90s movies out of the Top 5. According to research by Best Buy UK, which surveyed 2000 people across Britain, the millions of dollars invested in CGI, special effects and 3D technology have failed to dent our love of more established film franchises. Of those surveyed, 20% said they preferred Indiana Jones to modern day action blockbusters, Die Hard star Bruce Willis is our No.1 action hero and The Joker in the Batman films beats Darth Vader from Star Wars to take the top villain crown. This summer, blockbuster cinema releases have included X-Men Origins and Harry Potter and the Deathly Hallows: Part 2, with the new Mission Impossible movie due out later this year. The survey was commissioned to coincide with the exclusive release of The Last Airbender on 3D Blu-ray through Best Buy.